A polar bear is tapped to fill in for Santa in this fun and familiar story about saving Christmas. 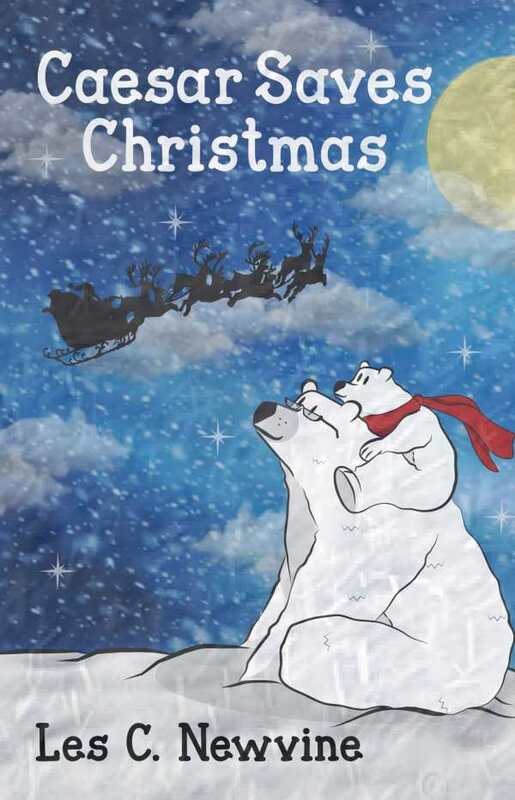 A polar bear named Caesar and his granddaughter help Santa Claus complete his Christmas Eve deliveries in Les C. Newvine’s picture book, Caesar Saves Christmas. In children’s literature, and in picture books in particular, Santa Claus has had a number of helpers who’ve saved Christmas. The most famous of those helpers, Rudolph, garners a mention in Newvine’s book, but this time the star is Caesar. When wandering the Arctic on Christmas Eve with his granddaughter, Snowflake, Caesar hears a tremendous noise and decides to investigate. A blizzard has caused Santa’s sleigh to crash. Santa and some of his reindeer are hurt, and Caesar is asked to fill in, with Snowflake assisting. Two new reindeer, Misty and Dusty, step in for the injured animals. At one house, he stepped out of the sleigh too quickly. Upon doing so, he slipped on an icy patch of the roof. This caused him to slide downward. Caesar slid all the way to the edge of the roof. He hung on to the eaves before he dropped into a snowbank. Caesar also gets stuck in a chimney, but does finally get to enjoy some cookies left out for Santa before the night’s work is done. Newvine writes in short, clear sentences—perfect for readers just venturing into books that don’t feature images on every page. The full-page illustrations that are included—on average, one every three pages or so—are excellent, with bright colors, rich backgrounds, and expressive faces. Some references might need to be explained to children, including one that mentions the expectation of a “one-hundred-year blizzard”—a term that is apparently intended to mean a storm of rare ferocity, but that might have kids asking if snowstorms can really last a century. Caesar Saves Christmas includes all the critical elements of a “saving Christmas” story—helpful animals, amusing errors, a happy ending—and does it very well, even though some of its tropes are familiar. Newvine has written a fun and worthy addition to the genre of Christmas emergency assistance tales.